The Alabama Crimson Tide vs. LSU Tigers has become the marquee matchup in college football. This was their third time to play in the last year, including the BCS National Championship Game. This game was played in Death Valley and the LSU Tigers came out loose. The Tigers gave Alabama everything they had, and LSU coach Les Mile rolled the dice all night long. Unfortunately for him those gambles did not work out for the Tigers. Alabama responded to the tough atmosphere to rally and take the win 21-17, staying undefeated and atop the BCS polls. Alabama quarterback A.J. McCarron came into the game as a Heisman contender. He played well in the 1st half, struggled for the majority of the 2nd half, but responded when his team needed him, driving his team to a comeback victory. McCarron started slow, only completing 2 of 6 passes in the 1st quarter, but got hot in the 2nd quarter, completing 7 of 9 and giving the Tide the lead at the half. The Tigers defense played really well for most of the 2nd half, holding McCarron to only 1 of 7 completions before the winning drive. LSU started the scoring on their second series of the game. Using their running game, the Tigers drove 53 yards on 12 plays and then got a 38 yard field goal to take a 3-0 lead. The Crimson Tide finally got hot in the 2nd quarter and using a combination of runs by running back T.J. Yeldon and McCarron passes scored on a 1 yard Eddie Lacey run to take a 7-3 lead. LSU responded, moving the ball to the Alabama 30 yard line. Miles tried the first of his gambles, trying a fake field goal, but the Crimson Tide was ready for it. Linebacker Nico Johnson stopped LSU kicker Drew Alleman and Alabama took over possession of the ball. The Crimson Tide went 3 and out on their next series, punting the ball to LSU. The Tigers again moved the ball well, but missed a 54 yard field goal with 1:03 left in the 1st half. McCarron gave a preview of things to come, mixing 3 completions with an Eddie Lacy run to give his team the ball at the LSU 9 yard line. From there, McCarron dropped back to pass and when he couldn’t find anyone open, ran the ball in from 9 yards out to give his team a 14-3 halftime lead. The LSU offense is based on using multiple backs to pound the ball in the running game then utilizing play action passes to catch the defense napping. By using multiple backs, they have backs with fresh legs to take advantage of a tired defense late in the game. The Tigers used this approach in the second half, scoring 14 straight points. The first touchdown was a classic LSU drive, 13 plays, 10 runs and 3 passes and ended up with freshman running back Jeremy Hill scoring from 1 yard out. After the touchdown, Miles rolled the dice again and called for an onside kick. The Tigers recovered, but kicker James Hairston was called for touching the ball before it went 10 yards. The Crimson Tide got the ball at the LSU 40 in great field position. 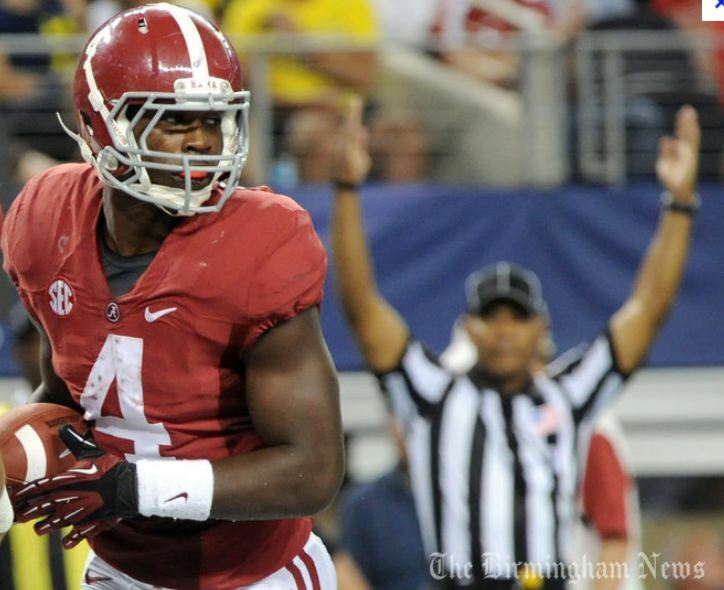 Alabama moved the ball into the red zone, but Yeldon fumbled and LSU defensive end Sam Montgomery recovered the ball. Having dodged a bullet, the Tigers seemed to gain new life. One the second play from scrimmage with the ball at their own 13, LSU QB Zach Mettenberger threw a short swing pass to fullback J.C. Copeland and he shook off two tacklers and rumbled 42 yards down the sideline. Mettenberger then got into rhythm and completed three passes, including a 14 yarder to Jarvis Landry for a touchdown to put LSU up 17-14. After a 3 and out by Alabama, LSU got the ball back and Mettenberger moved his team into Crimson Tide territory. The drive stalled at the Alabama 24 and the Tigers once again gambled, going for it on 4th down, but freshman defensive lineman D.J. Pettway stopped LSU running back Spencer Ware on 4th down. After another 3 and out by Alabama, LSU drove into Alabama territory again, but missed a 45 yard field goal. The LSU missed field goal gave the Crimson Tide one last chance to win the game. They trailed 17-14 with the ball at their own 28 yard line with 1:34 left to play. McCarron showed the heart of a champion by completing three straight passes to Kevin Norwood to move them into LSU territory at the 28 yard line. After an incomplete pass to Norwood, McCarron completed a screen pass to T.J. Yeldon who ran it all way to pay dirt, giving Alabama a 21-17 lead with 0:51 left. The Alabama defense stiffened on LSU’s last possession and the Crimson Tide escaped with a comeback win on the road. LSU played really well, but just didn’t quite have enough to get the win. They dominated time of possession 39:15 to 20:45 and they are the first team this year to have more than 100 yards rushing against the Alabama defense. LSU QB Zach Mettenberger has been heavily criticized this year, but with his performance in the 2nd half, he may be coming into his own as a quarterback. A.J. McCarron-QB- Jr: As a sophomore, McCarron started the year in a quarterback competition with Phillip Sims for the starting position. McCarron won the competition and led his team to a national championship; however he was just a game manager that was asked to not take chances and don’t turn the ball over. This year he has become more comfortable and is in the conversation for the Heisman Trophy. To win the Heisman you need what is called a “Heisman Moment” and this may have been it. The Crimson Tide has been blowing away teams all year and this is the first time that McCarron has been asked to go win a game. He came through with flying colors, taking his team 72 yards in 5 plays, using only 0:43 off the clock. He completed 4 of 5 passes in the game winning drive. McCarron has thrown 290 straight passes without an interception. He completed 14 of 27 for 165 yards and 1 touchdown. Eddie Lacy-RB-Jr: Eddie Lacy is a powerful 220 pound hammer. His signature move is a spin move that makes it hard to get a solid hit on him. Lacy is light on his feet and has good balance. Once he his momentum moving forward he is hard to stop. Lacy is also a good outlet receiver. He had 83 yards on 11 carries and one touchdown. His longest run was 28 yards. Kevin Norwood-WR-Jr: Kevin Norwood also stepped up on the last drive for the Crimson Tide. After only have 2 catches prior to the drive, he had 3 catches for 41 yards on the game winning drive. He and McCarron took the team on their backs to win the game. Norwood can get over defensive backs to make the catch on high balls or he will lay out to make the diving catch. He has very good footwork on sideline throws. Norwood led the team in receptions with 5 catches for 62 yards. Michael Williams-TE-Sr: Michael Williams is a 6’6” 269 pound tight end with soft hands. He uses his big body to create mismatches in the secondary. He has good speed and can stretch the defense vertically and run down the seam of a zone defense. Williams is also a good blocker. He was held to 1 catch for 6 yards. Kelly Johnson-TE-Sr: Kelly Johnson is a versatile player that can play fullback or tight end. He is used similar to former Alabama player Brad Smelley. Johnson had 1 catch for 10 yards. Barrett Jones-C-Sr: Barrett Jones may be the best lineman in the country and a likely early first round draft pick. The NFL loves versatile players and you won’t find a more versatile lineman than Jones. Early in his career, he played guard. Last year he was moved to left tackle and now he is the center. Jones controls his opponent, no matter where he plays. He does a good job in setting up short in pass blocking and preventing inside penetration. He threw a key block on Eddie Lacy’s touchdown run. Chance Warmack-G-Sr: Chance Warmack will probably be the second Alabama lineman drafted in the first round of the NFL draft. He is a mobile player that does a good job pulling and can get out to the second level to block linebackers. D.J. Fluker-OT-Sr: D.J. Fluker is a road grader that dominates in the running game. He is a big part of the success of the Alabama rushing attack. He did a good job against LSU’s NFL caliber defensive ends, but he did have one holding penalty. Damion Square-DE-Sr: Damion Square is a defensive end that plays the run well. He can also contribute as a pass rusher, but his strength is against the run. Against LSU he had 5 tackles, 1 tackle for loss and a sack to end the game and run out the clock. Jesse Williams-NT-Sr: Jesse Williams is a former 3-4 defensive end that has been moved to the nose this year. With his 6’4” and 320 lbs. frame he probably is a better fit there and he has played better this year after the move. He is very tough to block due to his ability to shed blockers and clog the middle of the line. He has a good swim technique and he demands double teams. He moves well for a big man. Williams had a dominant game against LSU with 7 tackles and 1 tackle for loss. Ed Stinson-DE-Jr: Ed Stinson is a run stuffing defensive end. He has good mobility and can make plays down the line of scrimmage. Against LSU he had 2 tackles, including a big stop on 3rd down that led to a punt. Nico Johnson-ILB-Sr: Nico Johnson is a good run stuffing inside linebacker. He flows well to the ball and is a good open field tackler. Johnson had a good game against LSU, making 12 tackles and ½ tackle for loss. His stop on a fake field goal forced a turnover on downs and stopped a potential Tiger scoring drive. C.J. Mosley – ILB – Jr: C.J. Mosley leads the Crimson Tide with 69 tackles. He does a good job running to the ball and tackling in space. Mosley is good in pass coverage and is Alabama’s best pass defending linebacker. He may be best known for his pick six against Michigan in the first game of the year. Against LSU he had 4 tackles, ½ tackle for loss and ½ sack. He also batted down a pass by reacting and coming from the other side of the formation to get his hand on the ball. Dee Milliner-CB-Jr: Crimson Tide coach Nick Saban is known for his expertise in coaching defensive backs. Dee Milliner is the next in a line of shutdown corners that have come out of Alabama. He is a physical corner that jams the receiver at the line of scrimmage and recovers well once the ball is in the air. Milliner blitzes well and is good in run support, using good tackling technique. Against LSU he had 8 tackles, 2 tackles for loss and 1 sack. Deion Belue-CB-Jr: Deion Belue plays good tight coverage. He was beat for a touchdown by Jarvis Landry, but his coverage probably couldn’t have been much better. Landry just made a very good play on the ball. Belue does a good job in run support and doesn’t mind going low to take out the ball carrier’s feet. Against LSU he had 9 tackles and 1 ½ tackles for loss. Robert Lester-S-Sr: Robert Lester plays center field in the Crimson Tide secondary and many times is the last line of defense. He does a good job keep plays in front of him and he breaks well on the ball in the air. Lester is a good tackler who wraps up the ball carrier. Against LSU he had 3 tackles. Nick Perry-S-Jr: Nick Perry plays the run very well. His tackling technique is very good and he is willing to take on bigger running backs. Against LSU he had a season high 10 tackles. Zach Mettenberger –QB-Jr: Zach Mettenberger has been the lightning rod for all that’s wrong with the LSU offense, but to be fair, the offensive line has been shuffled due to injuries and he hasn’t been protected very well. His receivers have also had a severe case of the drops. He has a big arm, but he needs to work on his ball placement. He does a good job when he can use play action, then boot to the right side. Mettenberger is a tough kid that will stand in the pocket, deliver the ball and take hits. He shows streaks of coming around as a quarterback but he needs to work on consistency. Mettenberger came out in the 2nd half against the Crimson Tide and got on a nice roll, and looked like the game might be starting to slow down for him. If he continues the level of play he had in the 2nd half of this game, LSU is going to be hard to beat from here on out. Against Alabama he completed 24 of 35 passes for 298 yards and 1 touchdown. Michael Ford-RB-Jr: LSU likes to use multiple backs to pound the defense. In the last 3 games, freshman Jeremy Hill has taken over as the lead back which relegated Ford to mostly returning kickoffs. Against Alabama, he only had 3 carries for 13 yards. Ford also made a mistake in the return game, returning a kickoff from deep in his end zone and only got the ball out to the 15 yard line. Spencer Ware-RB-Jr: Spencer Ware is in much the same boat as Ford when it comes to playing time. The one thing Ware has going for him is that he can run the wildcat which gives him a few more snaps. Ware is also a good receiver, able to run patterns down the field. Against Alabama, he carried the ball 7 times for 13 yards and had 1 catch for 38 yards. J. C. Copeland-FB-Sr: The 270 pound former defensive lineman continues to improve as a fullback. He is a dominating lead blocker, but he also has good hands. Copeland bounces off tacklers and uses his strength to pull out of the grasp of defenders. He is strong and hard to bring down once he gets his momentum going. Against Alabama, he had 3 carries for 6 carries and 2 catches for 47 yards. His 42 yard catch and run got his team out of the shadow of its own goal and gave his team an emotional lift. Kadron Boone-WR-Jr: Kadron Boone has gotten more playing time in an effort to find dependable receivers that do not drop the ball. He has good hands and fights for the ball when it’s in the air. Once he makes the catch he slips tackles and gets extra yardage. Against Alabama, he had 4 catches for 37 yards. Russell Shepard-WR-Sr: Russell Shepard was a highly recruited high school quarterback. He is officially listed as a wide receiver, but the Tigers move him around, sometimes running him from the backfield. Against Towson, he had a 78 yard run and led the team in rushing in that game. Against Alabama he had 3 carries for 22 yards. Josh Dworaczyk-OL-Sr: Dworaczyk, normally a guard, continues to bail his team out, playing out of position at left tackle. He did a good job against the Crimson Tide defensive line. P.J. Lonergan-C-Sr: P.J. Lonergan had his hands full against Jesse Williams. Williams outweighs Lonergan by about 20 pounds and was a disruptive force all day. Barkevious Mingo-DE-Jr: Barkevious Mingo is a pass rushing beast. He is probably an outside linebacker in the pros in the mold of a Clay Matthews or James Harrison. He puts continuous pressure on the quarterback and gets his hands up when he can’t get there. Against Alabama he had 2 tackles, ½ tackle for loss and a batted pass on 3rd down to force a punt. Bennie Logan-DT-Jr: Bennie Logan is a defensive tackle that eats up blockers. He can also push the pocket from the inside and gets his hands up when rushing the quarterback. Against Alabama he had 2 tackles and 1 batted pass. Sam Montgomery-DE-Jr: Sam Montgomery is a relentless pass rusher and teams with Mingo to strike terror in the hearts of opposing quarterbacks. He has the speed to run straight through blocks. Montgomery is an active player that chases the ball all over the field. Against Alabama he had 3 tackles, 1 tackle for loss, 1 sack and a fumble recovery in the red zone to stop a scoring threat. Kevin Minter-MLB-Jr: Kevin Minter is a force in the middle of the Tigers defense. He is an explosive player that is a tackling machine. Minter has good speed and is very good in pass coverage. He is the Tigers leading tackler. Against Alabama he had 7 tackles, 1 pass broken up and 1 QB hurry. Eric Reid-S-Jr: Eric Reid plays the run well and closes quickly on the ball carrier. He is a tough player that bruised his ribs in the 2nd quarter, but returned in the 3rd quarter. Against Alabama he had 7 tackles. Craig Loston-S-Jr: Craig Loston teams with Eric Reid to give the Tigers two tough versatile safeties. He is aggressive and flies to the ball. That trait sometimes makes him vulnerable to play action passes. Against Alabama he had 7 tackles. This entry was posted on November 6, 2012 by draftmaniacs in Scouting reports.